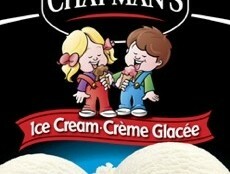 Here’s a scoop: business is booming for Chapman’s Ice Cream, Canada’s best-selling privately owned ice cream processor. Situated in Markdale, Ont. where the Chapman family put down roots, the family business has survived the ravages of a fire nine years ago to rise from the ashes as one of Canada’s true success stories—not just in sales, but also with its philanthropy. And, while Chapman’s Ice Cream’s biggest concern seems to be finding enough employees to further its growth, at least the company is secure in knowing that its products are produced in facilities that the ice cream industry considers to be among the best in the world. Company vice-president Ashley Chapman, the son of founders David and Penny Chapman, told Food in Canada during an interview at the company’s seemingly ever-expanding multi-building operation, that the devastating fire that gutted the dairy on September 4, 2009 provided an opportunity for the family to remain true to itself as one of the largest employers in the area. Such philanthropy also extends externally to the community, with a recent seven-figure donation to help build a hospice in Owen Sound, and construction of nine well-maintained soccer fields on lands owned by the family for use by community youth sports. At the time of the fire, the company had 325 employees. Today it has 700 full-time and 150 seasonal workers. Despite the huge increase in employment opportunities, however, Chapman said he would prefer to have an additional 100 seasonal workers in place to better compensate for the company’s on-going and consistent growth—the only thing affecting the extremely positive mood of the ice cream processor these days. The rebuilt Chapman’s Ice Cream facility is, simply put, huge, and features the 365,000 square foot Phoenix (rising from the ashes) main headquarters and nut-free production facility; a 110,000 square foot building for processing of any product containing nuts; a 35,000 square foot water treatment facility; a 130,000 square foot dry warehouse; and a 150,000 square foot distribution centre—with plenty more room on the property to grow when the time eventually comes. According to Chapman, butterfat is where dairy farmers make money, with farmers paid by the amount of butterfat in their milk, typically 3.5 to four per cent. Butterfat is the necessary component within dairy processing, and especially in the production of ice cream. “Also, most people aren’t aware that the naturally occurring dairy trans fats are good for you, as it increases all the good cholesterol and decreases the bad cholesterol, according to studies,” he said. Within the facilities, Chapman is very proud of the efforts his family have made with regards to worker and food safety. The company maintains Grade A status certification from the globally-renowned BRC (British Retail Consortium), which includes a fully-developed HACCP (Hazard Analysis Critical Control Points) plan following North American and EU standards, maintains nut-free accreditation from SAI Global and NSF (National Sanitation Foundation), and performs several points of validation in its systems via the Guelph Food Technology Centre. The Attec Food Type 23835 boot cleaner—installed by Shawpak Systems—drops a cleaning agent over the footwear as spiralling brushes scrub the liquid across the sides and soles of the footwear to better-ensure a clean work environment at Chapman Ice Cream in Markdale, Ont. Creating a safe work environment goes hand-in-hand with creating a safe product for consumers, he said. Drainage is a key feature within the Chapman’s facilities—something often overlooked as “just pipes” by other dairy processors—with all plant floor drains documented and identified with clearly-marked lists and maps. As part of its safety protocols, all drains are cleaned per a specific schedule and frequency. All floor drains within the processing, production and storage areas are cleaned twice a week—approximately 1,000 drains; and floor drains in non-manufacturing areas, such as engine rooms and maintenance shops, are cleaned on a monthly basis. Said Chapman: “Drains are cleaned by dedicated trained staff five days a week over three shifts, utilizing specific tools, brushes, carts and other equipment used solely by drain cleaners. “All drain parts are cleaned from cover, basket, body and pipe,” he said. The drains are cleaned by manual removal of debris, water pre-rinsing, and brushing all surfaces with a chlorinated alkali detergent solution, with a water post-rinsing of all surfaces by flooding with a quaternary ammonium sanitizing solution. 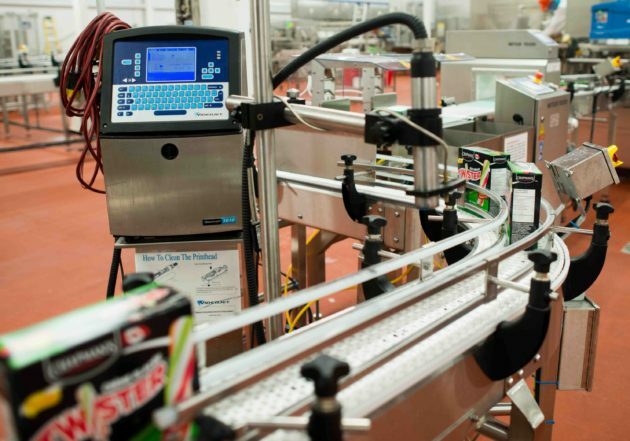 A Videojet 1610 continuous inkjet coder applies lot code data and best-before information onto packs of Chapman Ice Cream Twister product at its nut-free production facility. The same attention to detail is done via clean-in-place (CIP) efforts—either based on time or production run such as a switch in product where there may be any risk of carry-over of an undeclared ingredient or allergen. “Then there’s also the situation when we run the same product over several shifts. For product quality and safety, production is stopped after an allotted amount of time to perform cleaning,” he said. The lines are rinsed out and connected to a central CIP system that is programmed to rinse, wash and sanitize the equipment to ensure it is free from any dirt or carried over materials, and is free of any pathogenic bacteria. The program of the central CIP system monitors and records cleaning time, temperature, flow rates and chemical strength of the detergents and sanitizers. Exiting the filler, paperboard backs are sealed via a Nordson ProBlue 10 hot melt adhesive system. The company has validated its cleaning programs to ensure it can adequately remove allergenic material and bacteria by testing the cleaned surfaces using ATP (advanced testing system) swabs, micro swabs and allergen specific swabs. 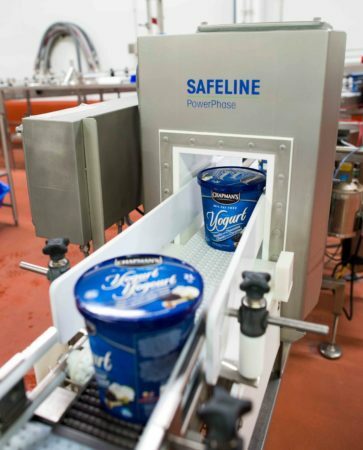 One of several Safeline PowerPhase metal detection units spread throughout the Chapman Ice Cream complex, here checking buckets of frozen Yogurt product. 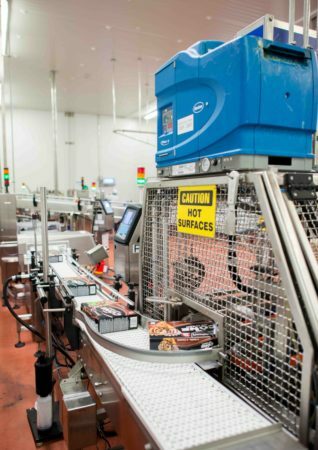 For workers entering—and exiting—the processing facilities at Chapman’s, there is the Attec Food Technology hygiene system, installed by Shawpak Systems of Oakville, Ont. Employees and visitors begin by donning company-cleaned and supplied uniforms—with as many changes as necessary depending on the day—put on TSSA-approved ( the Technical Standards and Safety Authority administers and enforces technical standards in the province of Ontario) safety boots with steel toes and under shank, and then apply a hair balaclava and bump cap. After suiting up, they then proceed to place their hands within an Attec Type 23741 soap dispenser. When a sensor detects the presence of both hands, P3-manosoft soap from Ecolab is released onto each hand, and a turnstile is engaged to allow the entrant to the next step of sanitation consisting of a touch less hand washing and drying station. 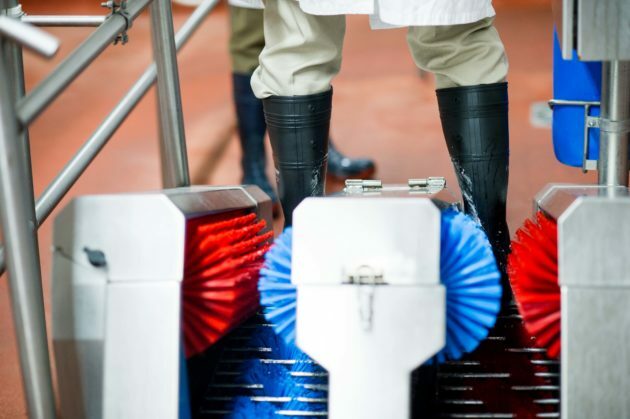 The employees then walk through an Attec Food Type 23835 boot cleaner that drops a cleaning agent over the footwear as spiralling brushes scrub the liquid across the sides and soles of the footwear. After passing through the boot cleaner, employees and visitors proceed through another turnstile—this one depositing hand sanitizer to complete the process. Moving through the final door providing entrance into the work environment, employees are then mandated to put on latex of non-latex gloves for the handling of all product and materials—depending on the requisite job function. 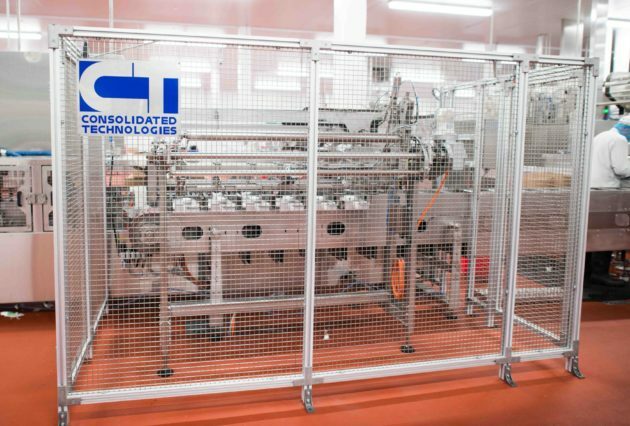 Chapman’s Ice Cream uses a cartoner from Consolidated Technologies on one of its production lines. Keeping things clean and safe is the key to Chapman’s success. 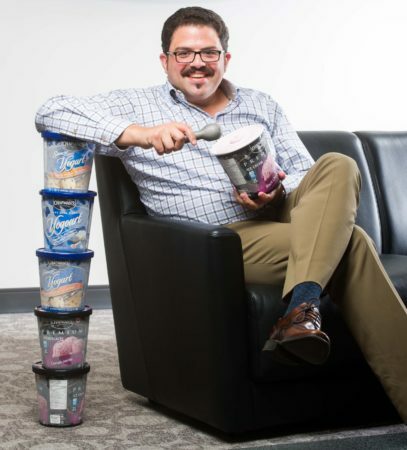 The successful implementation of that mantra has maintained the ice cream processor’s sterling reputation within the frozen dairy industry and with its growing number of customers.